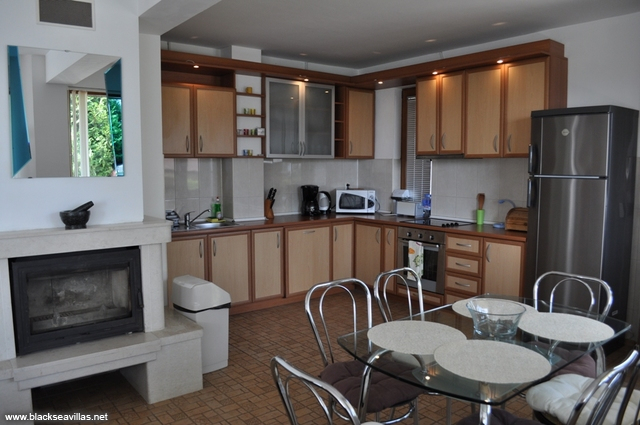 Rent a villa with 4 bedrooms overlooking Albena resort. Private pool and great BBQ area. 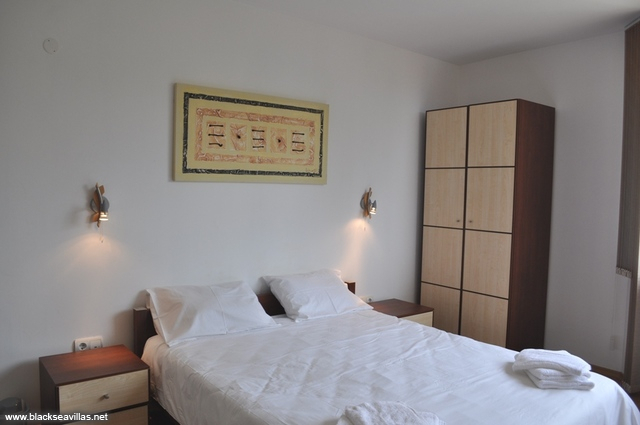 SPECIAL 10% DISCOUNT FOR ALL BOOKINGS FOR MAY, JUNE AND SEPTEMBER 2019! 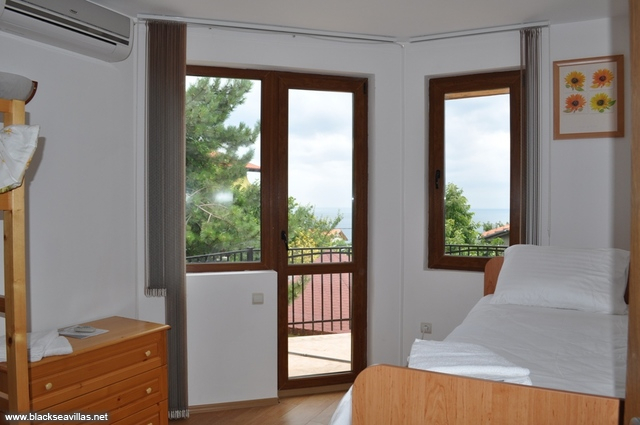 Villa Sansara is a comfortable holiday property, located on a hillside overlooking Albena resort. 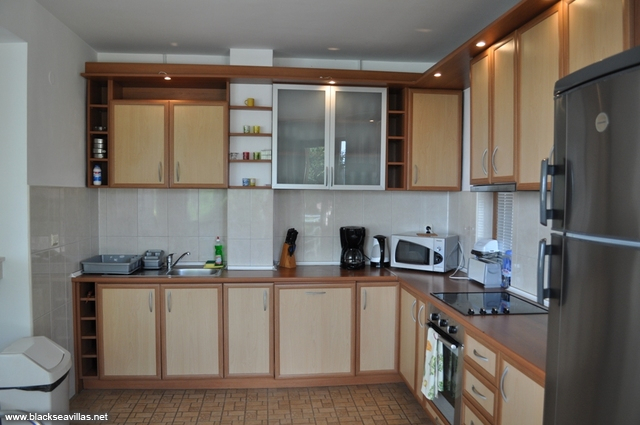 With its prime location in villa area "Izgrev" the house offers a quiet vacation not far away from the beach. The nearby family seaside resort Albena will surprise you with its great variety of bars, restaurants, mini train, mini golf, water sports, horseback riding and very good choice of children activities. If you travel a bit further north after some 8 km you will reach the sea town of Balchik, very well known with the Botanical Garden and the charming restaurants along the promenade. 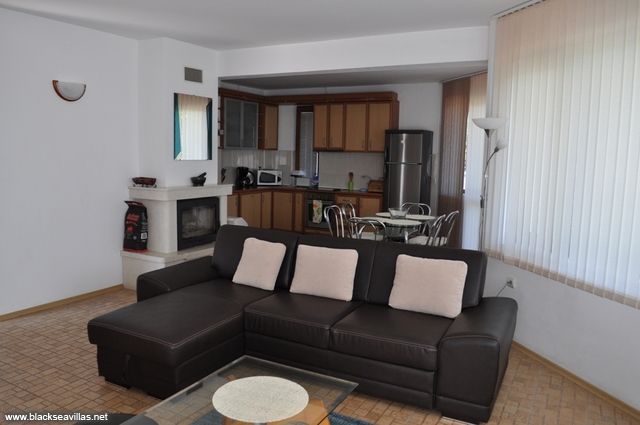 A short drive not more than 10 minutes after Balchik is located the Golf Riviera of Bulgaria with its 3 golf courses. 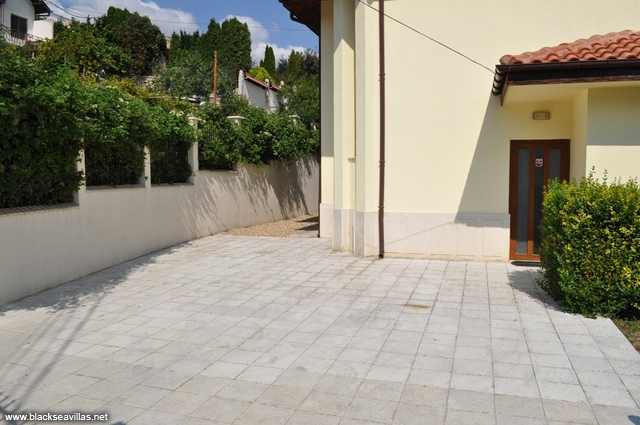 The entrance to Villa Sansara is via private locking gates with space for 1 or 2 cars, depending on their size. 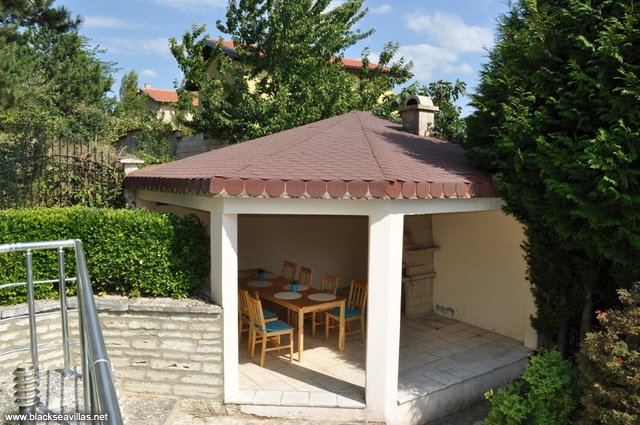 The villa is with beautifully tended garden and private swimming pool in front. 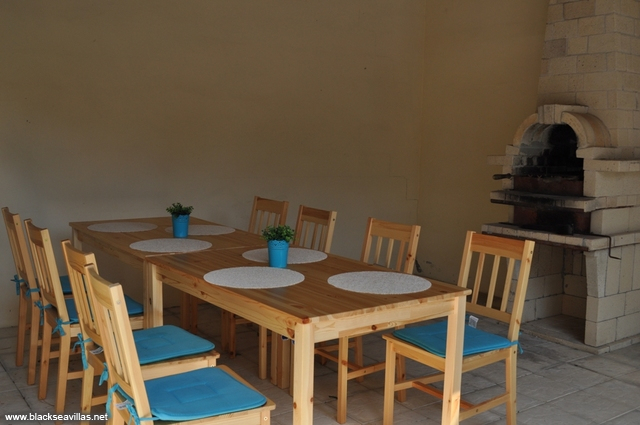 Just right to it is the brick BBQ with covered area, two wooden tables and 8 chairs, with direct access and view to the pool – you can easily keep an eye on the children while drinking your afternoon coffee. An evening meal here with friends and family would be truly memorable. The villa is spread out on 2 floors. The ground floor is a large open plan living room, which incorporates a lounge area with two sofas and Satellite TV/DVD/CD corner, a small dining area with 6 seats and equipped kitchen. The kitchen facilities include refrigerator with freezer, 4 electric hobs, oven, extractor, toaster, microwave, coffee machine, el. kettle, small washing machine. From the living room you can go out to the garden with pool and BBQ area, conveniently surrounded with tall Thuja trees for maximum privacy having in mind the populated villa area. 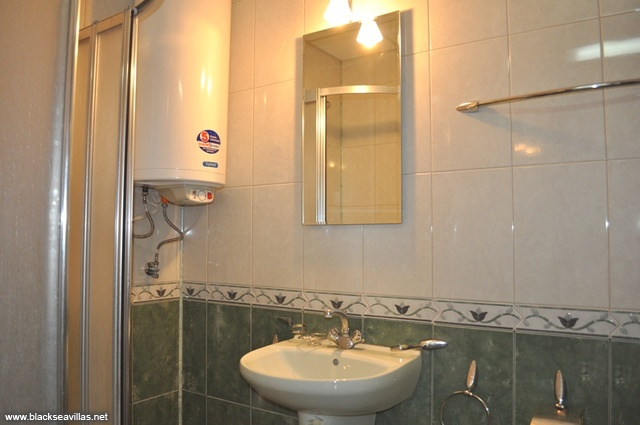 On the same floor there are a twin bedroom with available baby cot, a shower-room and separate WC only. The internal staircase leads to the upper floor, where the three bedrooms are -two double bedrooms (one of them is en-suite with shower-room) and one with two bunk beds for children. 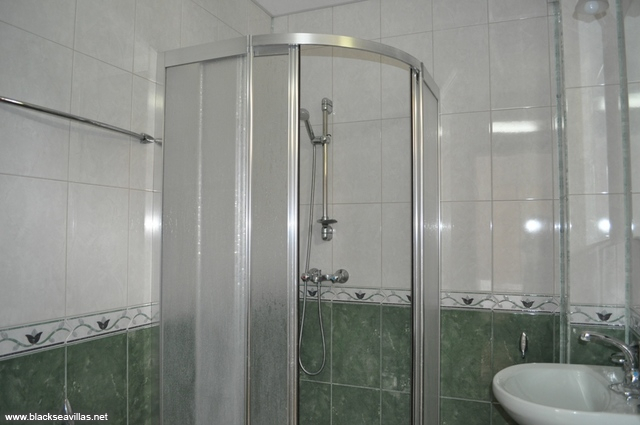 Also, from the corridor there is an access to another shower -room with WC for use from the rest two bedrooms. 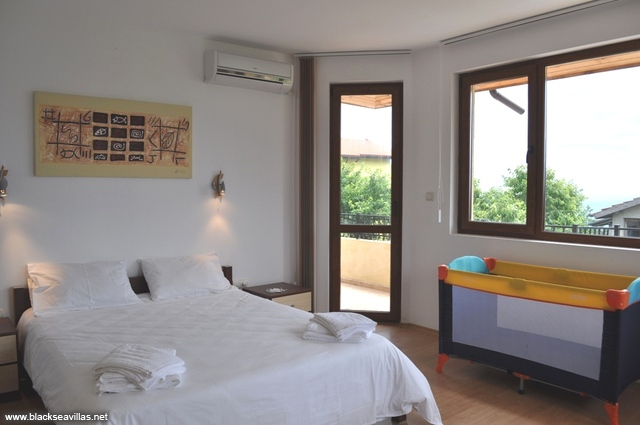 The children’s bedroom and one of the double bedrooms have direct access to the central balcony with partly view towards the sea and Albena resort. The other double bedroom has its own small aside balcony. 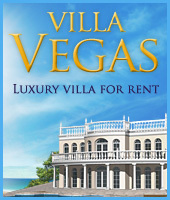 Notes: The villa is fully air-conditioned. Satellite TV available only in the ground floor living room. DVD and CD provided. Guests use free Wi-Fi. Available BBQ area with garden furniture. Secure parking space in the yard for 1 - 2 cars, depending on size. There is option for parking 1 or 2 more cars on the street. Pool size: 5,50 m x 3,50 m x 1,50 m. There is no pool for children. 5 sun-lounges are available. Please, bring your own beach or pool towels. The beautiful Albena resort is the second biggest beach resort on the North Black sea coast in Bulgaria. With its 17 tennis courses, a riding club with 30 horses and 2 arenas, 21 outdoor and an indoor pools, a yacht club, fitness centres, playgrounds for beach volleyball, bowling hall, a centre for paragliding, parachute jumps, plenty of restaurants and bars, Albena resort has a lot to offer for a full and completely vacation. 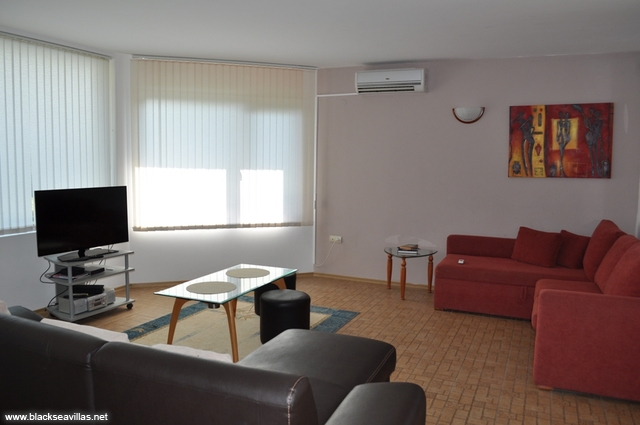 The resort is situated only 30 km away from Bulgaria's sea capital Varna. It is remarkable for its 6-km long beach. It has 43 hotels (2 to 4 stars), situated at the very beach or at the picturesque hills with exciting views of the sea and the "Balata" National Reserve. Dobrich: Due to its generous land, the area of Dobrich town is called the ’Granary of Bulgaria’. Dobrich is the eighth most populated town in Bulgaria, being the centre of the historical region of Southern Dobrudja, and is located 30 km west of the Bulgarian Black Sea Coast, not far from resorts such as Albena, Balchik, and Golden Sands. Some of the sights in Dobrich are the museum of Yordan Yovkov (great Bulgarian writer), the "Old town" of Dobrich with different handcraft workshops, the ruins of a Middle Ages settlement, the ancient necropolis and a big number of monuments.